24" Compact Heat Pump Ventless Dryer 4.1 cu-ft, Chrome Door Ring, Interior Lighting, White. Pairs with the WM98400SX2 and WM98200SX2 front load washers. Always in the vanguard, Blomberg was among the very first to bring innovative ventless heat pump technology to the market. The ultimate solution for compact spaces and dwellings where it’s impractical or impossible to vent to the outside, this dryer uses a closed loop heat exchange system to dry at lower temperatures, saving money on energy bills and providing superior protection for clothes. Blomberg knows space is often at a premium, but that doesn’t mean sacrificing style or superior performance. 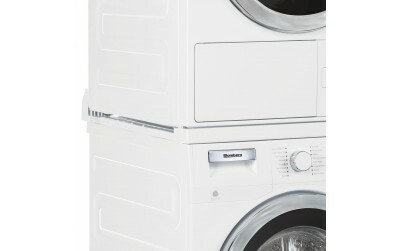 Despite their compact size, our dryers deftly handle 4.1 cu. ft. loads with a variety of cycles for different fabrics. Blomberg believes laundry care should be elegantly simple. 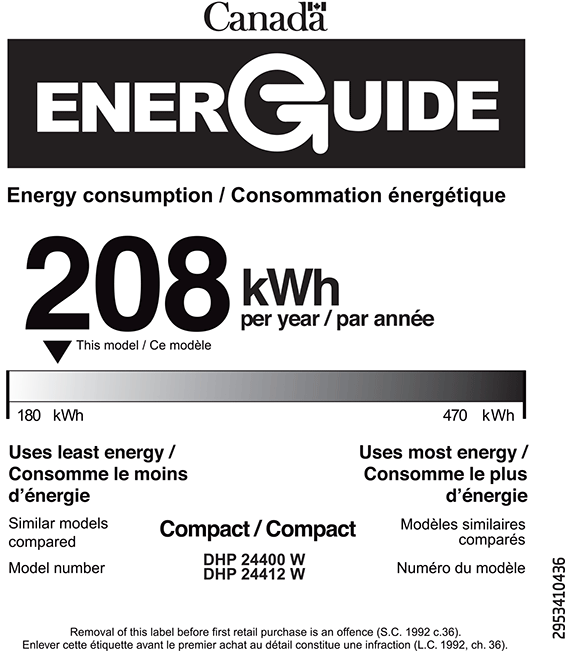 Our ergonomically positioned, fully electronic LCD digital controls are especially user-friendly. The control panel helps you by suggesting the correct settings for getting the very best results. Then simply press “start” and go. The gentle drum action of a Blomberg dryer separates and smooths out individual garments as they dry, so when the cycle finishes clothes come out wrinkle-free and ready to wear. But just in case you’re not immediately available when the cycle stops, this clever option keeps the drum rotating periodically for up to two hours and keeps your clothes from creasing. Blomberg’s closed loop heat exchange system means our heat pump dryers use a circulating air temperature that is consistently 40 percent lower than conventional dryers. This gentle care helps keep all fabrics—even woolens—at their best and extend garment life. Blomberg understands today’s many fabric choices place different demands on laundry equipment. Weightier textiles such as denim are difficult to dry using normal drying cycles. Our special jeans program is specially calibrated to dry denim, fleece, and other heavier fabrics with optimal results in a minimum of time. Blomberg believes no detail should be overlooked when designing superior appliances. 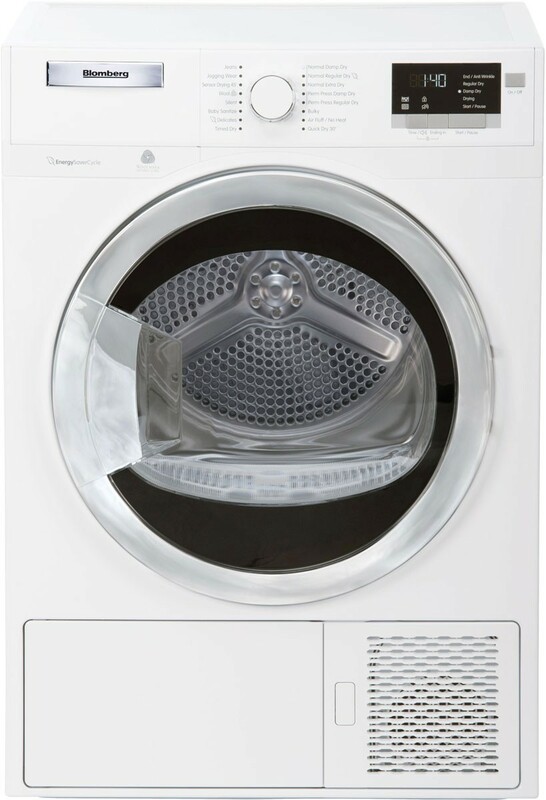 Our heat pump dryers feature a bright interior LED light to help you spot that last sock and make unloading easier. Innovative heat pump dryers from Blomberg are engineered for optimal safety and efficiency, including the condenser system. A calibrated water-level sensor identifies any deviation from the correct water level in the tank and automatically starts draining if the level is exceeded. 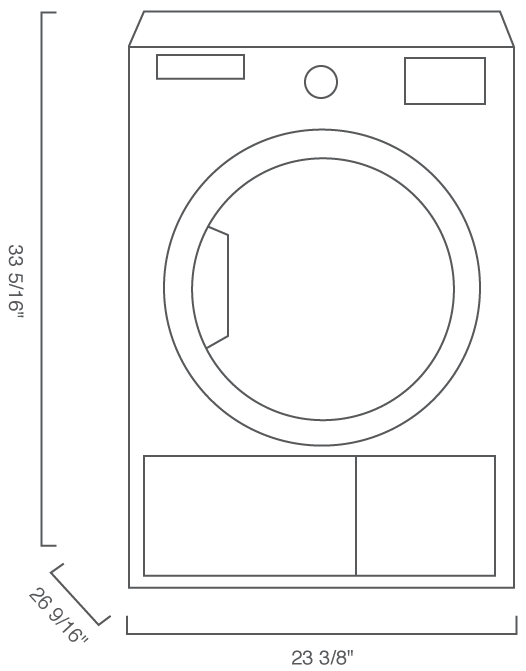 Product Dimensions (HxWxD) in 33 5/16" x 23 3/8" x 26 9/16"
Packed Dimensions (HxWxD) in 35 1/4" x 26" x 26 3/8"
24" Ventless Heat Pump Dryer is rated 3.7 out of 5 by 3. Rated 5 out of 5 by Owen from Still great, two years after purchase This dryer has a been as star performer. The heat pump dries clothes consistently, and takes 50-80 minutes for a full load, which is a bit slower than a regular dryer, but not enough to notice. Despite being a compact unit it keeps up with our household (two adults two kids) with no problem. You need to clean the lint screen like a regular dryer, and clean the second filter every week or two, which is a 3-4 minute task. We think it's worth it for the dramatic reduction in energy use--this uses less than half as much energy as the most efficient regular dryer. Rated 1 out of 5 by HortonHouse from Would Never Purchase Again This dryer takes forever, has very difficult to keep running in order to dry clothes. I called the company and was advised to use timed dry and it still does not dry the clothes. The dry selections are confusing and do not work. Rated 5 out of 5 by Richard44 from Outstanding Washer and Dryer We are extemely happy with the quality of wash. It is extremely efficient and quiet. Reasonable use of detergent. It operates quietly. The dryer being non- vented amazes us with its drying power.